Hello, everyone!!! There has been a lot happening in the AGBC with Luciana’s upcoming release, Truly Me boy dolls, and whatnot. But I won’t be discussing that right now, becuase . . . In this post, I will be showing you what I got for Christmas that is doll-related! I am not trying to brag. I just want to show you what I got, because I am super excited about it!!!!! First off, we have Kit’s Photographer Outfit. I think this thing is so darn cute. My grandma got it for me, just like she got all of the other AG outfits I will be showing you today. Here is the Blue Rhinestone Studded Dress. I like it a lot, except the hemline is a little short. Some leggings could fix that, but I was being lazy and not wanting to dig through my AG clothes. This is the AG Graphic Fashion Tee! I think it’s adorable, personally. Since I don’t care for Em’s PJ shirt right now, I think this will be her new one. It matches the pants perfectly! This last outfit is Z’s Sightseeing Outfit. IT’S SO CUTE!!!!! It looks adorable on Tessa. The dress is gorgeous with and without the shirt. My best friend got me these two pairs of glasses. Tessa can be a movie star OR a nerd!! Can it get any better???? Which pair do you think looks best on her? The same friend also gave me this super-cute pattern for AG pajamas!!! Lastly, my father bought me this AWESOME TRIPOD!!!! IT IS EXACTLY WHAT I WANTED!!!!! The pictures of the dolls and presents above were taken using the tripod, and they look so much better! I will be getting Tessa’s profile up hopefully today, so check back soon for that! P.S. I will be getting a new sign-off on January 1st – and I am thinking about revamping my blog’s design!!!! It’s Christmas! Finally! December 25th, 2017. I hope you all are having a very merry Christmas. Please, chat away in the comments. Tell me what you got, what you’re having for dinner, how your family celebrated, traditions, etc. “Can we open presents now?” Lindsey begs. “I think this one is for you, Lindsey,” Molly says, handing Lindsey a bright red bag. “This one is yours, Grace,” Morgan says sweetly, holding up a brown box tied with a bright red bow. “This one is for you, Morgan,” Emily tells her sister softly. “Aw, a chew toy for Chocolate Chip! He’ll love it – thank you!” Morgan exclaims. “Now, here’s your present, Em,” Morgan says, handing Emily a Santa Claus bag. Emily pulls out the wrapping paper. “Hey, Crystal, here’s yours,” Molly tells Crystal, holding up her present. “Eek! A fairy costume! Hold on, let me go put it on!” Crystal shrieks. She returns a few minutes later wearing the glitzy costume. “McKenna, this one is yours,” Lindsey says. Molly pulls out the tissue paper, practically smothering herself. All of a sudden, the doorbell rings. Crystal ingores her and jets up the stairs in her fairy costume. “Oh, my apologies,” Crystal says, sliding her fairy mask on top of her head. 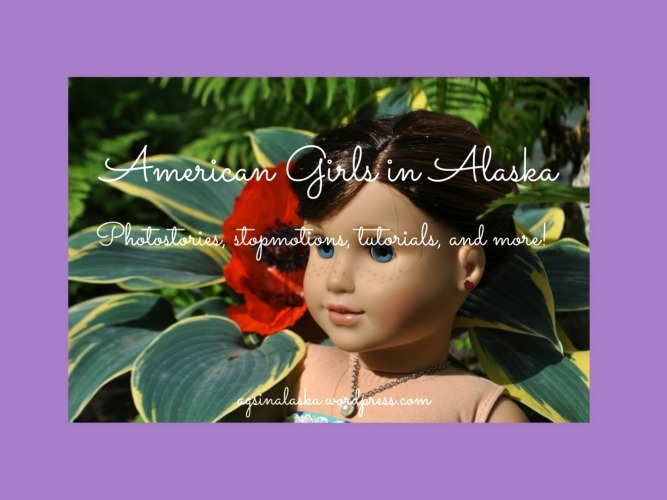 “Is this the American Girls in Alaska family?” the girl asks in a Southern accent. “Hey, who’s this?” Grace asks, bounding up the stairs. “I have no idea,” Crystal replies. “I’m Tessa,” the girl says in a Southern accent. “Hey, I’m Grace,” Grace introduces herself. “Hey, who’re you?” Lindsey asks rudely. “And this is Emily,” Morgan says, prodding Emily forward. “Why don’t you come downstairs?” Crystal asks Tessa. I GOT A NEW DOLL!!!!!!!!!!!!!!! Tessa Elizabeth is a customized Truly Me #24 doll who I bought off of Ebay. I purchased a wig from Beautifully Custom, the Cocoa Caramel Swirl wig. Isn’t it gorgeous???? Anyway, I love Tessa sooooo much, and I hope you’ll all welcome her into the American Girls in Alaska family. I will be contacting you shortly to get your shipping address. If you would like to enter another giveaway of mine, never fear, because I will be doing one shortly. I am thinking about doing one for my 100th post, which is very soon. A big thank you to AG Doll Dreams for her amazing Fitbit tutorial and to Micah @ Mixiepixie7 on YouTube for her mini book tutorial. Go check out AG Doll Dreams blog here and, if you’re allowed to, check out Micah’s channel on YouTube. Okay, everyone! That is all for now! I will be back later today with The Christmas Tag, which I was nominated for. But until then . . .